Given their ubiquity as an ingredient in cooking, it's remarkably easy to forget that store-bought eggs weren't actually laid for the purpose of being eaten. But an egg's truly miraculous potential wasn't lost on this sweet little bird. 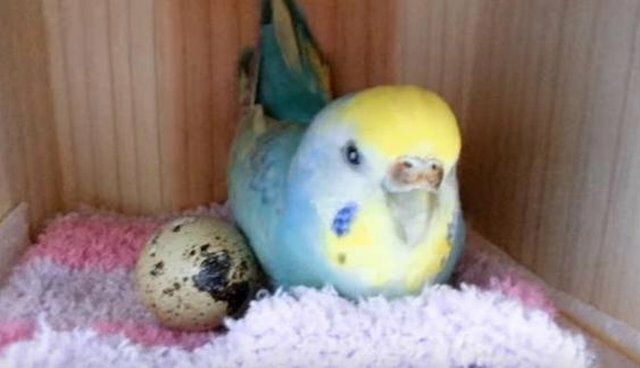 After the bird's owner, a YouTube user named Luna, bought some quail eggs at a supermarket in Japan, she decided to give one to her budgie, Pi-chan. Incredibly, the feathered pet readily adopted the egg, keeping it cozy and warm in her nesting box as if it were one of her own. Consumer eggs, of course, are suppose to be unfertilized, so Pi-chan's efforts were assumed to be in vain - but then something quite unexpected happened: The egg actually hatched, revealing the most adorable baby quail. Thanks to Pi-chan's kindheartedness, a "faulty" fertilized egg was able to carry out its intended purpose - giving rise to new life. Based on a reading of the video's description translated from Japanese it seems that the quail may have survived only a short time after hatching. But considering the egg's original fate as food, it's still no small miracle that she had the chance to live at all. Update: A reader from Japan, who commented to this post on Facebook, writes that our interpretation of the video's description text was incorrect, and that the baby quail did in fact survive.